I love Ubuntu Touch and have been using it on a LG Nexus 4 for a couple of months. 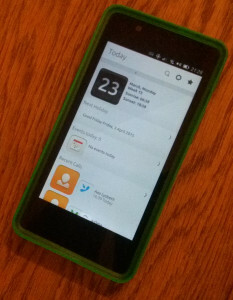 Now that my real Ubuntu phone has arrived in the shape of a BQ Aquaris 4.5 Ubuntu Edition, it is time to properly connect it to my address book and calendars which I have on ownCloud (thanks to Eliwan). Ubuntu is a great operating system for the smartphone. One of the extra attractions is the ability to be avoid disclosing private information to one of big IT companies like Apple, Google or Microsoft. Unfortunately though, there is no user interface (should I say ‘app’) yet to enter the necessary configuration. You have to do this using the shell at this moment. From the configuration app select ‘About this phone’ and then (at the bottom) ‘Developer mode’. Switch it on. From a Ubuntu PC, run “adb shell”. If adb is not available it will tell you how to install it. If you don’t have a Ubuntu PC you can run the commands below from the shell app. Replace ‘yourUserName’ with your username and ‘yourPassword’ with your password. The ‘https://me.eliwan.net/cloud’ should be replaced by your ownCloud root. Replace ‘yourUserName’ with your username. The ‘https://me.eliwan.net/cloud’ should be replaced by your ownCloud root. You can verify the link using the chain icon (CalDAV link) in the user interface. Replace ‘calendarName’ with the name of your calendar and ‘yourUserName’ with your username. The ‘https://me.eliwan.net/cloud’ should be replaced by your ownCloud root. ‘LocalName’ needs to be replaced with the name you want for the calendar in the calendar app. There is one minor glitch I see at this moment. The ‘all-day events’ are currently visible in the calendar in both the day itself and the following day. If you want to add the calendar app to the launcher which is displayed when swiping from the left you should open the app, then swipe from the left (all across the screen) to make sure the launcher stays on screen. With the calendar open the calendar icon should be there. Now indicate and hold the calendar item. This should display a little menu with the item ‘pin shortcut’. Select that. Specific instructions have been added to create additional calendars when needed. Enjoy!